It is important to recognise moneylenders as legitimate agents of economic activity. They have extensive network and substantial credibility. Banks must treat them as channel partners and provide them with credit. Importantly, moneylenders should have the flexibility to access the deposits from the public, as any other financial institution. We have an uncanny knack of turning our strengths into weaknesses and de-legitimising the role and contribution of significant segments of the economy. Somewhere in the 1950s, the experts who dominated our planning process decided that traditional moneylenders are Frankensteins to be exorcised by the state’s socialist institutions. Such thinking was further reinforced after the bank nationalisation process of the late 1960s, and this resulted in a distorted financial system wherein their presence and relevance is real, but not acknowledged to be. The Household Indebtedness and Investment Survey, conducted by the National Sample Survey Organisation (59th Round) in 2003, brings out the important role of moneylenders in the credit system. Table 1 provides the aggregate debt, the estimated number of households that are indebted, and the amount involved. In all, the indebtedness was of the order of Rs 1,76,795 crore as of June 2002. Rural households, which form 73 per cent of the total households, hold 63 per cent of the debt, and urban households, constituting 27 per cent, the other 37 per cent. The Incidence of Indebtedness (IOI), or the percentage of indebted households , is nearly 27 in the rural areas and 18 in the urban areas (it is 24 for the country as a whole). 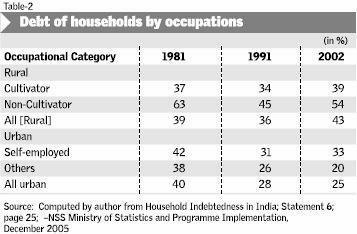 Every fourth household is, thus, indebted, with an average debt of nearly Rs 9,000. The level of indebtedness by the households is both from institutional and non-institutional sources. The former are mainly co-operative societies/banks and commercial banks and the latter moneylenders and, to some extent, friends/relatives. The share of non-institutional category (mainly moneylenders) has actually risen in the rural areas between 1981 and 2002, and nearly 45 per cent of lending in the rural areas is by moneylenders and 25 per cent of urban indebtedness is due to moneylenders (Table 2). In the rural areas, the dependence of non-cultivators on moneylenders was nearly 54 per cent in 2002 and of the self-employed in the urban areas, 33 per cent. The survey also suggests that interest rates are more on the high side for non-institutional lending compared to institutional lending. Around 40 per cent of the lending by moneylenders was at interest rates above 30 per cent in the rural areas in 2002, and in the urban areas nearly a third of the lending was above 30 per cent. The institutional rates during the period were between 10 per cent and 20 per cent in large proportion of lending both in the rural and urban areas. This is also as expected since money lending is based more on trust than on collateral or possibility of government write-off and, hence, the risk is higher. Given the level of penetration and provision of credit, it is difficult to recognise the moneylender as a legitimate agent of economic activity and impose phenomenal restrictions on him as he is not legitimate in the eyes of the Anglo-Saxon financial system. For instance, that they can lend but not borrow from the public in carrying on their avocation. Under the current RBI regulations, a butcher, barber or baker can borrow money and, of course, corporate tycoons and share market operators, but not a moneylender (Section 45-S of the RBI Act). A moneylender can lend but not borrow except from relatives. In the context of safe guarding the interest of the depositors, we have gone to the other extreme, which has an impact on the credit market, particularly pertaining to retail trade and restaurants, which depend on the moneylenders for their business activities. It is also possible that the deposit-taking activity has gone behind the `veil’, or underground, and it is much more difficult to `unveil’ the unincorporated situation than the corporate sector. In a large country such as India, with substantial growth in the service activities where the share of Proprietorship and Partnership firms is significant, it is important to recognise the role played by moneylenders, or unincorporated bodies (UIBs) as they are called in the Indian credit literature. They have extensive network and substantial credibility among their constituents — both borrowers and lenders. Their ability to access the public for deposits is the linking point for meeting the requirements of the customers on both sides, since the base is the unincorporated sector in both the situations. Banks must treat them as channel partners and provide them with credit. But, at the same time, they should have the flexibility to access deposits from the public like any other financial institution. Financial systems are fascinating learning tools where the input/throughput/output mechanism in terms of borrowing/processing/and lending enhances and enriches the institutions. If any one node is missing, they do not learn and mostly fail. In a developing country such as India, multiple institutions catering to different segments and capable of accessing funds from the public/market/ institutions are needed. Unless an institution accesses funds using extensive network it will not understand the magic of the lending market. A prudential lender is one who borrows efficiently. It is actually two sides of the same coin. Making institutions to lend without borrowing from the public will weaken the learning curve and goes against the cannon of the `Triple Nodes’ of a financial intermediary — borrow, analyse/process and lend. Not the least, it may create moral hazards — in a country such as India. The global institutions are encouraged to enter into the same money lending with modern acronyms of micro financing. If Washington gives a nod, it becomes the current thinking, but not our own existing strength. Another important aspect is that, in the urban areas, junior police forces are getting into moneylending because of their capability to `collect’ the amount and keep bad debts low. This will have far-reaching implications for the credit market. It may be much better to licence the regular moneylender, who has the tremendous advantage of the principle of Know-Your-Customer (KYC), and integrate him into the banking sector. Small businesses are more concerned about the availability of credit in a timely and flexible manner (without reams of paper work) than in the socialist rhetoric of the 1960s or the arrogance of the modern marauders in the guise of global financial institutions. The tremendous contribution of moneylenders to the economic boom should not be underestimated just because they are dhoti-clad, English illiterate and pan-chewing. Recognise them, legitimise them and consider them a source of strength and opportunity for channelling credit to remote parts of the country in a systematic and orderly manner. Therein lies our ingenuity in realising a more than 10 per cent growth rate.